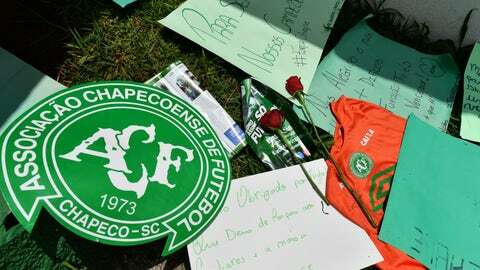 Atletico Nacional have requested that CONMEBOL give the 2016 Copa Sudamericana to Chapecoense following a fatal plane crash that occurred late Monday night. The plane was carrying the Chapecoense team on their way to Colombia for the first leg of the Copa Sudamericana final against Atletico Nacional, scheduled for November 30. Colombian officials said 71 people were killed and only six survived, per the Associated Press. Rather than play the final in the wake of the tragedy, Atletico Nacional asked CONMEBOL — the South American soccer confederation that puts on the tournament — to give the title to the grieving team. “After worrying about the human aspect, we thought about the competitive aspect and we want to publish this statement in which Atletico Nacional asks CONMEBOL to present the title for the Copa Sudamericana to Chapecoense to honor their big loss and as a posthumous honor to the victims of the fatal accident that our sport mourns,” the team said in a statement.